With the help of our families and volunteers, we added a series of raised garden beds to our school yard in 2017. Our students planted a variety of flowers and vegetables. From spring and into early summer, students watched their hard work grow into beautiful blooms, pollinators and veggies. In the fall, students harvested marigold seeds from plants and packaged them as thank you gifts to school donors. At MVCS, we encourage students to pack in reusable containers to limit our footprint on the planet. Hand-in-hand with this approach, we compost all food scraps and organic materials from our snacks, lunches, and other organic-related activities (like pumpkin carving!). Once composted, we add this rich organic material to our garden plots to watch the cycle begin again! On Friday October 13th MVCS students celebrated the changing of the season with our 2nd annual Harvest Festival. Students carved pumpkins, shared delicious snacks, and cut up LOTS of apples! 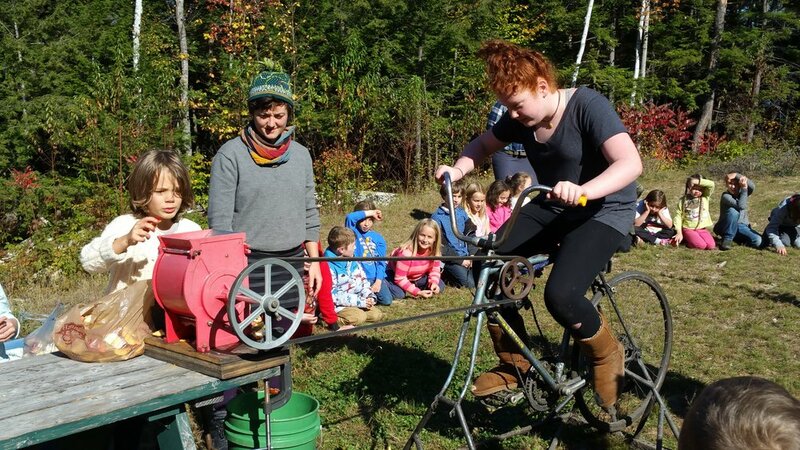 D Acres, a permaculture farm and educational homestead in Dorchester, brought a bicycle powered apple press and the whole school helped to make apple cider. It was amazing, delicious and hard work at its most rewarding! In the spring, we experience an old-fashioned New England tradition—making maple syrup! From tapping a tree to tasting delicious maple syrup, students participate in every step of the syrup making process. Our environmental educators help our students build tree identification skills; learn the parts of a tree and their functions; use measuring tools to find an appropriate tree to tap; use historical and modern tree tapping tools; learn the history of maple sugaring, including Native American legends, and; discover the math and chemical/physical science in the boiling process. Lower Elementary students measure the circumference of a sugar maple to determine how many taps to put in. Students use a hand drill to make a hole for a maple sap tap. Learning about the science of turning maple sap into maple syrup! Students watch as maple sap is reduced to maple syrup through evaporation.